SYNOPSIS: In a happy suburban neighborhood surrounded by white picket fences with flowering rose bushes, sits a black house with a dead lawn. Unbeknownst to the neighbors, hidden deep beneath this home is a vast secret hideout. 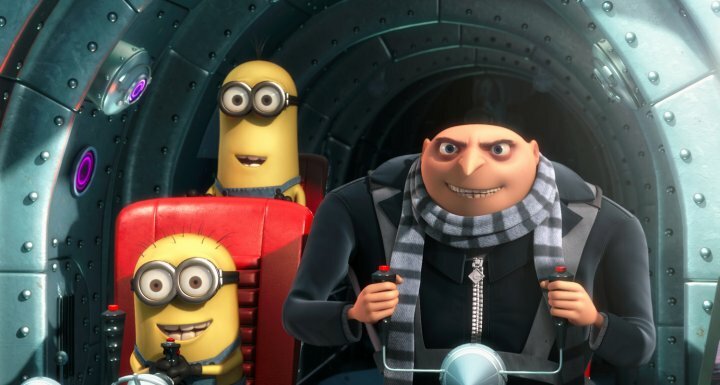 Surrounded by an army of tireless, little yellow minions, we discover Gru (Steve Carell) planning the biggest heist in the history of the world. He is going to steal the moon (Yes, the moon!) in Universal’s new 3-D CGI feature, Despicable Me. Gru: We stole the Statue of Liberty...! Gru: ...the small one, from Las Vegas! Gru (Steve Carell) is suffering from a super villain midlife crisis. He needs to prove to the world that he’s still got it. He wants to prove that not only is he still worthy of his super villain title, but that he is the best at his trade. So . . .
Gru: We are going to pull of the TRUE crime of the century... we are going to steal the MOON! What ambition, what determination, what a plan and what a charming story. For being such a villainous tale, this movie is very cute, funny, endearing, lighthearted and fun. It’s not exactly a roll on the floor comedy but it does have good laughs throughout with a pinch of near tear jerking moments. The story is entertaining and the characters themselves are just as entertaining as the story. Steve Carell was excellent in the lead role and you could tell that he was trying hard to not be the typical Steve Carell we see in most of his movies but instead actually playing this character. The very popular and talented supporting cast made it easier for Steve to shine. They all helped carry this movie and kept it going at a smooth pace. Easily the most popular characters associated with this film are the minions; the funny little yellow guys. Members of Gru’s super villain team, you will not understand but maybe a word of what they are saying but it doesn’t matter because you will be entranced by their cuteness and completely unpredictable behavior which at times can be brutal. But I will argue that the cutest characters would have to be the three little girls. Each of them is as unique as the next and they each have the ability to melt your heart. And nothing can melt the hardest of hearts like an adorably cute child. (Yeah, I’m using the word cute too much, right? Can’t help it). The leader in cuteness of the three sisters is undoubtedly the youngest one, Agnes. What I’m about to say might be considered blasphemy for many of you but I don’t recall seeing such a cute little animated girl since the cutest animated girl in motion picture history, Boo from Monsters, Inc. There is no beating around the bush with Agnes; she goes straight for your heart. She looks a lot like a slightly older Boo (maybe that’s why the comparison) and she also has the Puss in Boots begging-big-eyes look factor. What a deadly combination. This movie overall is not as big as most of the Pixar blockbusters or some of the Dreamworks classics, but it is a fun movie to watch and you won’t be disappointed. The icing on the cake is the lessons learned such as how the value of family can be greater than the moon. As for watching it in 3D or not, well watching it in 3D was nice and all but I wouldn’t exactly say that it’s a requirement. Directors Pierre Coffin and Chris Renaud have done an impressive job with this project considering it is the first major film direction for both of them. Oh yeah, and my daughter really enjoyed it too.